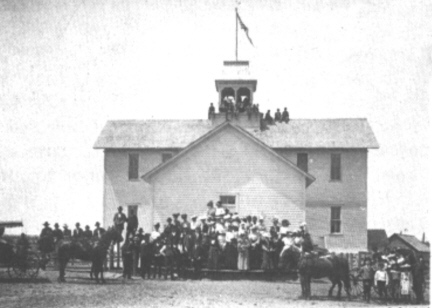 In the early 1890’s a one room school was built. Anna Wright from Neillsville was the first teacher. Then came Inez Short, Susie Korman, Grace Fergusen, Myrtle Beardsley and Mayme Breed. Inez Short married a Columbia boy, Fred Wright. In 1900 the school building become to small as there were about 85 pupils. A four room school was built with two rooms on the main floor being used for up to grade eight. It was the though that as Columbia grew in population the upstairs would be used for higher grades. The upper floor was used as an auditorium as it had a stage. Many home talent plays were given there. Taking part in the 1907 Thanksgiving program were Joe Malek, Wark Lockman, Frank Putz, John Larson in the back row. In the Second row are Ruth Iverson, Ida Schulz, Vivian Achenbach, and Sebe Schuman. Seated in front are Emma Moser, Albert Sollberger, Ethel Varney, Legar Appful, Leslie Babcock, Bertha Sollberger, Bill Sollberger, Jennie Winton and Ivar Christofferson. For two years Nell Ruddock of Neillsville was principal. Mayme Breed was the primary teacher. Miss Ruddock married a relative of Twamley’s and moved to California. 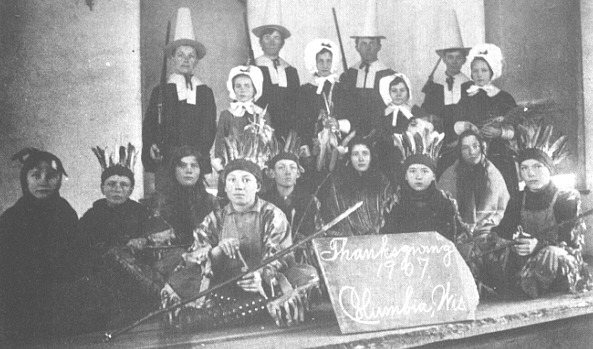 The Columbia School was the site of many community events like theFourth of July celebration in the picture. The roof also provided a place for ambitious Halloween pranksters to reassemble buggies.